For years we’ve seen the pictures of Maui’s clear blue water, soft sandy beaches, pristine forests and lush green mountains. It’s a travel destination that has always called to us, yet we had never made the trip. Last month however, we finally had the opportunity to experience the celebrated Hawaiian Island. 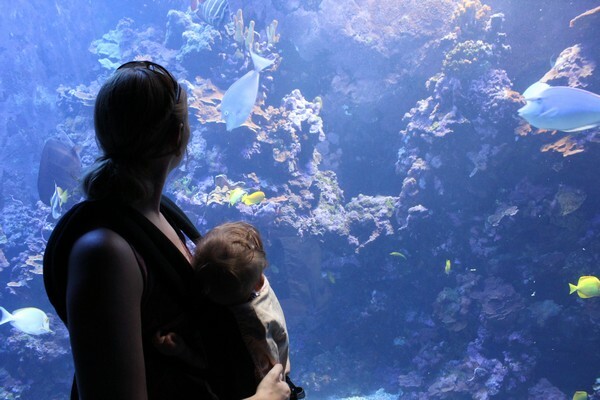 We traveled with our 7 month old infant son, so we didn’t know what to expect before our arrival. As newbie parents, many thoughts and fears came to mind. 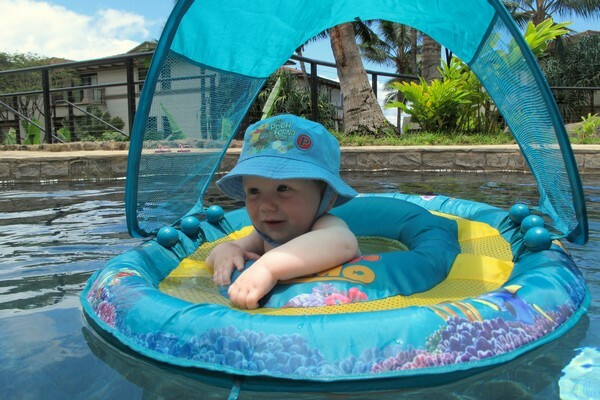 Would it be difficult traveling to Maui with an infant? What kind of sacrifices would we have to make? Will Baby B be comfortable? Will we be able to have a good time in Hawaii with an infant? We quickly learned that Maui is one of the most family friendly destinations we have been too. So we thought we would share some of the reasons we loved Maui as a destination for young families. Maui was clearly developed with families in mind. We didn’t have to sacrifice the things that we love to do on vacation because we were traveling with an infant. The hotel that we stayed at, the Sheraton Maui, offered several activities right at the resort, so there was no need to venture far away. We had the choice of fresh flower lei making, hula lessons and Baby B could even learn to play the ukulele (if he was a little older). The Sheraton Maui is the only hotel on the island that hosts a cliff dive ceremony, a sunset ritual that honors the last chief of Maui. Every evening, a young cliff diver re-traces the chief’s footsteps in the sand and leaps from sacred Puu Kekaa into the Pacific Ocean. We enjoyed watching the ceremony each night and even got the token tourist picture with the young cliff diver. Of course, a visit to Maui isn’t complete without attending a traditional Hawaiian Luau. The Sheraton Maui hosted a Luau on its property, so we didn’t even need to leave the hotel grounds to experience the time-honoured celebration. There were families with kids of all ages in attendance, which certainly added to the family friendly atmosphere. It’s also a great opportunity to try local cuisine like Poi and Kalua Pork. If you wish to venture away from the resort, we found there are plenty of family friendly activities like boat excursions, snorkeling adventures, whale watching, ziplining, hiking and a visit to the Maui Ocean Center (a highlight from our trip). Maui, the second largest of the Hawaiian Islands, offers all of the comforts of home – which we really liked. It’s fully developed and it offers stores that sell items we are familiar with (especially important when traveling with an infant). We could easily replace forgotten items and find the products we needed, like baby food and diapers. Traveling with a week’s worth of baby food would have been a big hassle. We were happy to find our preferred brand of baby food at the grocery store and that the packaging label was in English and displayed the ingredients. We also didn’t need to worry about difficult currency conversions since Maui is a US State. Being Canadian, we use US currency all the time and it’s easily accessible, making it simple to compute the exchange rates. Maui offers hundreds of condos and villas that include full kitchens and multiple bedrooms, which is a great alternative if you have kids. Dining out with a large family can break the travel budget quickly, so eating at your hotel/apartment will save you money and allow you to control your family’s diet. It also makes it easier to prepare baby purees or boil water for bottles. 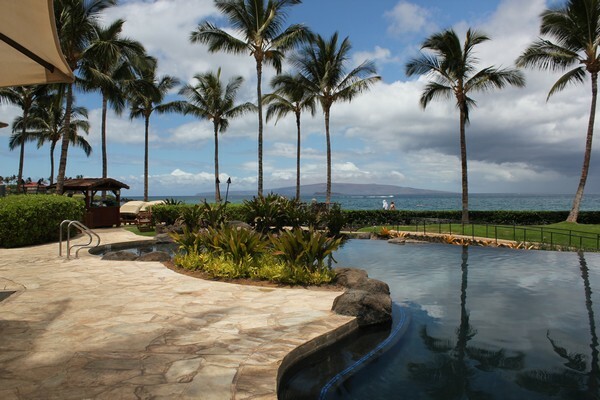 We stayed in two different locations on the island – Wailea and Kaanapali. Do your research before booking because we found that cities and beaches around the island are quite different. Wailea was more relaxed and upscale. Kaanapali was more touristy with a fun party vibe. We enjoyed both locations and really liked that we got to experience two different parts of the island. If you can’t decide on a location, pick two and split up your stay like we did – it felt like we had two vacations in one! We felt completely comfortable during our stay, which meant that we could sit back and relax without worry. Baby B could sense the calm in us, which translated into him being relaxed as well. We can see why Maui appeals to a variety of travel styles, like honeymooners, retirees and young families. As we searched online for average temperatures in Maui, we could see that no matter the time of year we planned to visit we were likely to catch some great weather. When planning a family vacation to tropical environments, it’s important to consider the weather because monsoons and tropical storms can put a serious dent in your travel plans. It’s great to have the peace of mind that sunshine and blue skies are highly probable in Hawaii.